Solder wire is an alloy or mixture of tin and lead or tin, silver and copper. There can be other composition as well but tin / lead (Sn / Pb) and Tin / Silver / Copper (Sn / Ag / Cu) is widely used and accepted. While Tin / Lead solder wire is called leaded wire, tin / silver / copper solder wire is called lead-free wire because there is no lead in it. The composition of leaded solder wire is 60 / 40 or 63 / 37 with 60 or 63 percent tin and 40 or 37 percent lead. The composition of lead-free solder wire is 96.5 / 3.0 / 0.5 with 96.5 percent tin, 3.0 percent silver and 0.5 percent copper. What is Solder Wire used For? Solder wire is used to solder electronic components, ICs or jumper. Since the introduction of RoHS (Restriction of Hazardous Substances) from electronics, more and more companies are using lead-free solder. Lead-free solder wire is available in many compositions but the most common composition is Tin / Silver / Copper in the Ratio 96.5:3.0:0.5. Solder wire is available in different diameters such 2.0mm, 1.5mm, 1.0mm, 0.5mm, 0.2mm etc. 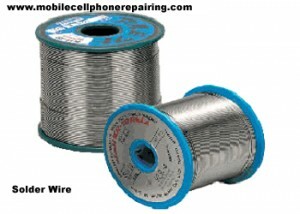 For mobile phone repairing 0.5mm solder wire is best suitable. Kester is a world-renowned best brand, manufacturer and supplier of solder wire and other soldering material including solder flux.